Turkey's President Recep Tayyip Erdogan addresses the supporters of his ruling Justice and Development Party, in Istanbul yesterday. AUSTRALIAN PRIME MINISTER Scott Morrison condemned the “reckless” and “highly offensive” comments made by Turkey’s President Recep Tayyip Erdogan in the wake of the Christchurch massacre. Morrison has warned that he would consider “all options” in reviewing ties between the two countries. He has also warned anti-Muslim Australians – like the suspected gunman – would be “sent back in coffins” like their grandfathers at Gallipoli, which was the scene of a blood-drenched WWI battle. “I am expecting, and I have asked, for these comments to be clarified, to be withdrawn,” said Morrison, who also faces an election challenge in the coming weeks. I’ve asked for these comments, particularly their reporting of the misrepresented position of Australia on Turkish television, the state-sponsored broadcaster, to be taken down and I expect that to occur. He described claims about Australia and New Zealand’s response to the white supremacist attack as “vile”. New Zealand Prime Minister Jacinda Ardern refused to be drawn on Erdogan’s comments, but said her deputy would be going to Turkey to “set the record straight”. In fiery remarks, Morrison accused Erdogan of betraying the promise of Mustafa Kemal Ataturk – the father of the modern state and a revered figure in Turkey – to forge peace between the two countries. There is no difference between the Johnnies and the Mehmets… after having lost their lives on this land they have become our sons as well. Peters announced yesterday that he would be travelling to Turkey this week at Istanbul’s request to attend a special meeting of the Organisation of Islamic Cooperation. Three Turkish nationals were wounded in the rampage that killed 50 worshippers at two mosques in the southern New Zealand city of Christchurch last Friday. The accused gunman, a self-avowed white supremacist from Australia, live-streamed much of the attack and spread a manifesto on social media claiming it was a strike against Muslim “invaders”. 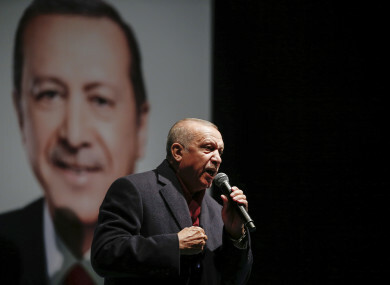 “This is not an isolated event, it is something more organised,” Erdogan said during a campaign event on Monday in Canakkale in western Turkey. They are testing us with the message they are sending us from New Zealand, 16,500 km (10,250 miles) from here. Email “Australia furious as Turkey's president refers to Gallipoli after Christchurch mosque attack”. Feedback on “Australia furious as Turkey's president refers to Gallipoli after Christchurch mosque attack”.